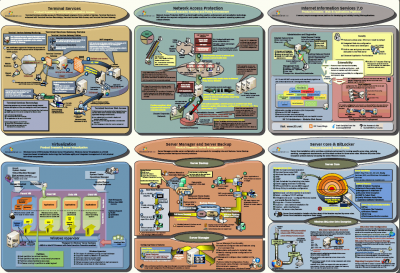 Microsoft has published two visually very appealing posters which depict in great detail important components of its upcoming OS Server 2008. 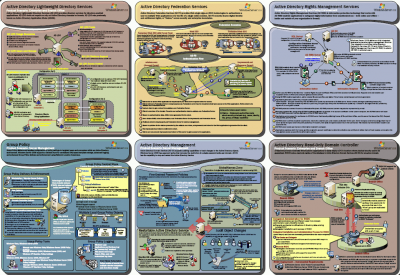 The poster on Active Directory Components details Lightweight Directory Services (formerly ADAM), Federation Services (ADFS), Rights Management Services, Group Policy, Management and Read-Only Domain Controller. The second poster shows the major new or updated features Terminal Services, Network Access Protection (NAP), IIS 7, Virtualization, Server Manager/Backup and Server Core. The following two screen shots give a low-res preview. I recommend printing out these two posters on the largest format color printer you can find and decorate your walls with them. The wife is going to love you for this. Hint: Adobe Reader 7 has massive performance problems with the files, it even brought up an error when rendering the Feature Components poster. Adobe Reader 8.1 is not only much faster but also more resilient. Adobe Reader 9.2 has not problems loading the posters, although it needs a couple of seconds for rendering.